As one of the top Rolex repair shops here in New York, NY, we keep a keen eye focused on the brand. Rolex is the #1 watch brand when it comes to brand recognition, and it’s no doubt the #1 brand of watches we see, and repair, the most here in our New York City watch repair shop. Nothing says “you’ve made it,” like a Rolex, and it’s far and away the leader in terms of sheer quantity. But that doesn’t make it plain or generic – not in the least. The brand keeps evolving as watch styles evolve, and it’s also evolving when it comes to technology. 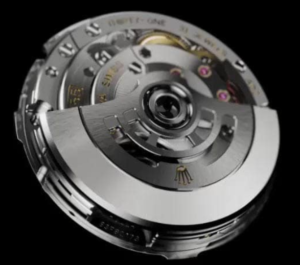 In this blog post, I’d like to highlight some of the features of the new mechanical movements announced by Rolex in 2015. Rolex inaugurated a new generation of mechanical movements in 2015. Fourteen patents protect Caliber 3235, which marks a new performance standard for the brand in terms of rate precision, power reserve, shock resistance, resistance to magnetic fields, ease of adjustment and reliability. Compared to its predecessor (Caliber 3135), 90 percent of its components have been revised and optimized: from the mainspring and the barrel to the automatic-winding mechanism, and from the gear train to the escapement. The Chronergy escapement increases the efficiency of the Swiss lever escapement by 15 percent. This accounts for nearly half the boost in the movement’s running autonomy, which now far surpasses Caliber 3135’s 48 hours; Caliber 3235 amasses a power reserve of approximately 70 hours. The new Chronergy escapement patented by Rolex, which combines high energy efficiency with great dependability. Made of nickel‑phosphorus, it is also insensitive to magnetic interference. The oscillator, the true heart of the watch, has an optimized blue Parachrom hairspring, which is also up to 10 times more precise than a traditional hairspring in case of shocks. Thanks to a new barrel architecture and the escapement’s superior efficiency, the power reserve of calibre 3255 extends to three days. This means the watch will easily continue to run from Friday evening into Monday afternoon even if not worn or wound. “Calibre 3255 is equipped with a self-winding module via a new-generation Perpetual rotor, for more rapid winding of the new high-capacity mainspring. The reversing wheel system enables winding in either direction of the weight rotation. This system, with its characteristic red wheels, has been optimized to reinforce its efficiency whatever the activity of the wearer. The now monobloc oscillating weight has been cut-out to absorb shocks. It is fitted on a ball bearing and is held at its centre by a single screw, thereby facilitating assembly. Of course what the wearer wants to know is that the watch is beautiful, that the watch says “I’ve made it,” and that the watch as both an object of art and a functioning timepiece keeps accurate time. Watches with this new mechanical movement by Rolex signify both of these things, and if you’re interested, check it out and even perhaps make a watch purchase. Rolex watches, after all, quickly become family heirlooms. Rolex watches, being mechanical, do need regular inspections and repairs. This is especially true, of course, the older the Rolex watch gets. We see many “heirloom” Rolex watches brought into our shop for repair. Many are inherited from family members, or perhaps have been in the family for generations. Others are being bought up by collectors. Many “vintage Rolex watches” are very popular with the younger set; there’s a huge rebirth of interest in mechanical luxury watches, and we’re seeing it here in New York, NY. So, if you own a Rolex and are concerned about its repair or upkeep, call the shop and come in for an inspection or possible repair. There is no great tragedy than to own a Rolex yet fail to wear it. Beauty demands to be experienced!